The orbits of stars within the central arcsecond of our galaxy. In the background, the central portion of a diffraction-limited image taken in 2012 is displayed. Image released October 4, 2012. Astronomers have found a star that breaks speed records as it orbits the Milky Way's central black hole, covering 3,100 miles (5,000 kilometers) per second as it whips around the black hole in less than a dozen years. The discovery offers scientists a unique chance within the decade to test Einstein's theory of relativity in an extreme environment. The star is named S0-102. It's one of a class of "S-stars" that surround the center of the sun's home galaxy in a kind of spherical shell. It has an orbital period of 11.5 years, give or take 3 1/2 months, making it the shortest-period star ever found in the region. The previous record was set by S0-2, which has a 16-year period. The presence of two short-period stars means astronomers can look at the precession (change in orientation) of their orbits over time and use that information to learn how much space has been curved by the immense gravity of the galaxy's central black hole, which weighs in at 4 million times the sun's mass. Other similar observations have been made of pairs of dense objects called neutron stars. However, because these stars can be only up to three times as massive as the sun, they don't curve space-time much more than the warping scientists see in the solar neighborhood. Thus, studying the space-time around the Milky Way's gigantic black hole should offer an unprecedented test. "This is the same idea in an unexplored parameter space," said Andrea Ghez, a professor of astronomy at the University of California, Los Angeles, and one of the leaders of the research team that found S0-102. "We know relativity breaks down on a small scale. We want to get as close to the event horizon as possible." The event horizon around a black hole is the point of no return — the closest anything can come without falling in. The stars S0-102 and S0-2 appear to get fairly close. Their orbits are so near the central black hole that the effects of space-time curvature should be clearly visible. And the presence of these two short-period stars will allow observers to measure the local space-time curvature far more accurately than one star would. The duo also helps astronomers take into account the fact that the gravitational mass of the central black hole isn't a perfect point; there are lots of other objects, such as remnants of dead stars, in the region that can cloud the observations. The two W. M. Keck Telescopes on Mauna Kea, Hawaii, observing the galactic center. The lasers are used to create an artificial star in Earth's upper atmosphere, which is then employed to measure the blurring effects of the lower atmosphere (the effect that makes the stars twinkle in the night sky). The blurring gets corrected in real time with the help of a deformable mirror. This is the so-called adaptive optics technique. Image released October 4, 2012. "Close" though, is a relative term. A 4 million solar-mass black hole has a radius of about 6.8 million miles (11 million kilometers). The closest S0-102 gets is 260 times the distance between the Earth and the sun, or about five times the distance between the sun and Pluto at its farthest. One of the unique things about S0-102 is astronomers have observed its orbit through one complete circuit. It last made its closest approach (periapse) to the central black hole in 2009, and should make another in 2020. Meanwhile, S0-2, the other record-holder, will reach periapse in 2018 or 2019. That's when it will be possible to measure their orbital precessions. Another test of relativity will be the stars' gravitational red shift. Light traveling from a star in a region of very curved space-time should be shifted from what one might expect in normal space. With two stars to observe, both of them reaching periapse in the next 10 years, researchers hope to get an accurate measurement. 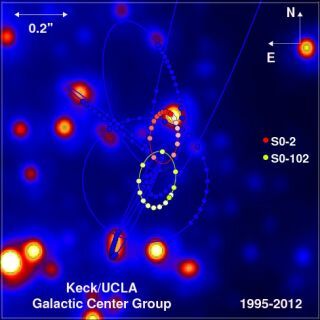 S0-102 was found by the Keck Observatory in Hawaii. Using adaptive optics, which correct for the blurriness caused by the Earth's atmosphere, the telescope made observations in long-wavelength infrared light that allowed the detection of S0-102 and other nearby stars. But to make some of the measurements to test relativity, scientists will need a new generation of instruments, including the huge Thirty Meter Telescope under construction in Hawaii. Few scientists expect the laws of relativity to be altered much by new observations. Mordecai-Mark Mac Low, curator-in-charge at the astrophysics department of the American Museum of Natural History, said it's very unlikely. "Relativity has survived every test we've thrown at it," he said. "The excitement here is that it's a way of testing relativity in a way that hasn't been tested before." Ghez, too, doesn't expect to see Einstein challenged. But she noted that it wasn't that long ago astronomers doubted stars could even survive so close to the galactic center. "Everything has taught us to expect surprises," she said. The findings are reported in a paper published in the Oct. 5 issue of the journal Science.